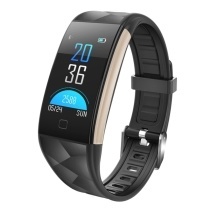 This smart bracelet, one key to measure heart rate, blood oxygen, blood pressure, always pay attention to your health. Take a long distance photo, seize the wonderful moment, easily freeze each smiling face. Call vibration reminder to avoid missing important calls. Intelligent reminder to stop you from missing new messages. One key to measure heart rate, blood oxygen, blood pressure, always pay attention to your health. Take a long distance photo, seize the wonderful moment, easily freeze each smiling face. Call vibration reminder to avoid missing important calls. Intelligent reminder to stop you from missing new messages. Keep track of every moment of your movement, and keep track of your steps, calories, and distance. Independent cycling mode, record your track record. Sleep data analysis allows you to develop good sleep habits. Support simplified Chinese, traditional Chinese, English, Japanese, Korean, Spanish, German, Italian, French, Greek, Turkish, Russian, Dutch, Portuguese. Portable USB charging, convenient and quick.